Since 2008, passenger traffic at Changi Airport has jumped by more than 35 per cent. Yet in these close to six years, there has been no increase in the number of security officers doing traveller, bag and other checks. This has not been at the expense of security, said Mr Martin Baptist, who heads Certis Cisco's integrated operations centre, but achieved through the use of manpower-saving technology, from cameras to thermal sensors. The firm, which bagged Changi Airport's security contract in 2008, recently had its tenure extended for another five years until March 2018. Mr Baptist, who gave The Straits Times a rare peek into the firm's operations centre at its Paya Lebar headquarters earlier this week, said: "In 2008, when we took over the Changi contract, we had about 2,300 officers on the ground. "It's the same number today." 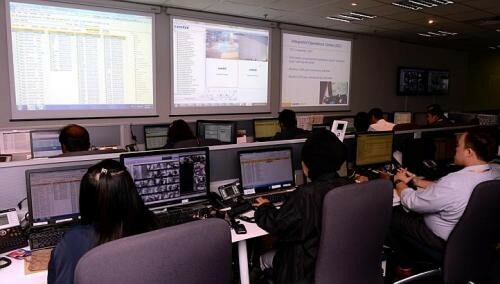 To keep a 24/7 watch on the airport, banks, MRT stations and other premises the firm monitors, Cisco Certis has invested close to $7 million in its two operations centres - one at Paya Lebar and the other at Changi Airport. In the three years up to March, close to 35,000 cameras have been installed islandwide. Such cameras help a team of 18 staff keep close watch on 800 officers deployed on the ground at Changi Airport at any one time, said Mr Baptist. The system is linked to the airport's flight database so officers are deployed "real time" as and when needed instead of "sitting around" and waiting for flights to depart and land, he said. Another innovation are the barcodes on arrival gates, which a guard can scan using a mobile phone to tell the operations centre he is where he needs to be. Thermal sensors at arrival doors also alert the operations centre when visitors attempt to enter the restricted area. The investment in technology has helped reduce the firm's reliance on manpower amid a labour crunch which has persisted for several years now. The long monotonous 12-hour shifts are major put-offs, according to industry veterans. This has seen some security firms pay newcomers a "joining bonus", typically around $5,000. "No matter how much money you throw, you are not going to get people rushing to become security guards," Mr Baptist said. The initiatives by Certis Cisco are in line with the airport's drive to rely less on manpower across its operations. At a recent press briefing on plans to expand Changi Airport, Senior Minister of State for Transport Josephine Teo, when asked how many more jobs the project would add, said that the focus is to be less manpower-intensive. The new Terminal 4, which will be ready in 2017, provides a "great opportunity" to test new systems, she added. "We are already beginning to look at ways in which we can use technology and innovation that enable the airport to function in a way that is not so heavily manpower-dependent."